This Carl K-13N Replacement Straight Blade Cartridge is compatible with DC-95N and DC-100N Model Rotary Trimmers. The handy cartridge design allows user to change or replace the blade without ever touching the sharp edge. *Open Safety Cover Lever on Blade Cartridge to expose the blade. When replacing the blade, do not touch blade edge directly. Welcome to MyBinding Video. 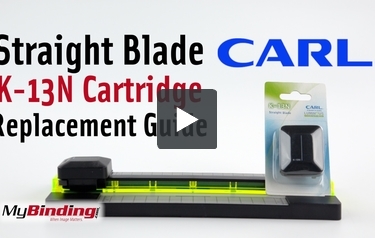 This is the Straight Blade K-13N Cartridge Replacement Guide. The K-13N cartridge is a compatible replacement for the Carl DC-95 and DC-100 rotary trimmers. First engage the blade safety on your old cartridge, then lift the stop at the end of the blade carriage. Slide the old cartridge off the carriage, and slip the new one on in its place. Lift the carriage and disengage the blade safety and you’re ready to go. These cartridges are sold individually. For more videos and all your binding needs, visit MyBinding.com.